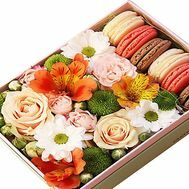 Flowers in a box of sweets will be the decorations of every celebration. 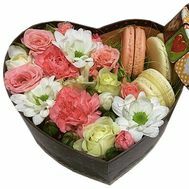 Present with sweets and flowers is universal and multifaceted in its essence. 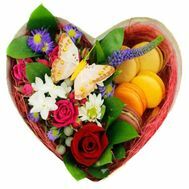 Flowers and compositions made of flowers with sweets are used both in the business environment and for romantic occasions. 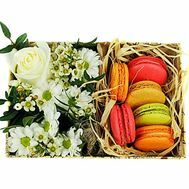 That's why buying them is so pleasant and easy, because knowing the preferences of your relatives and people who surround you, you will be able to congratulate them on their merits with the upcoming holidays! 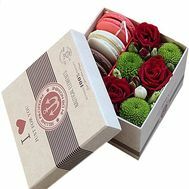 Gift boxes with flowers and sweets - this is perhaps the best invention of modern florists. 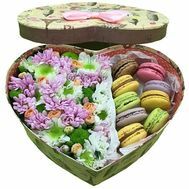 Flowers and sweets, even individually, are pleasant and unforgettable gifts, and in combination with each other can produce a real sensation. 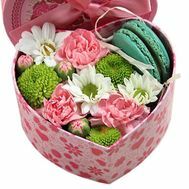 The beauty of this type of gift lies in many small things that at first glance you will not notice. 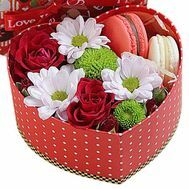 So, for example, a composition in a sweet box can be presented in nature or out of the house - the convenience of conveying the gift makes it particularly pleasant and comfortable for the recipient. 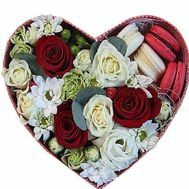 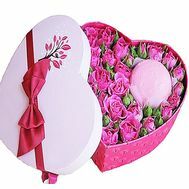 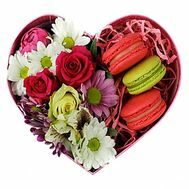 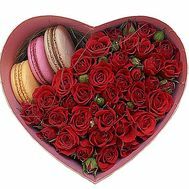 It is also known that it is flowers and sweets that can best emphasize feelings that are as sweet and bright as flower buds and candies inside the box. 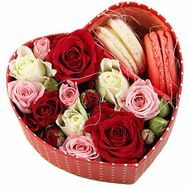 They are also suitable as an additional gift to other, more important - decorations, toys, equipment and much more. 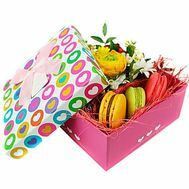 In our store you can find many variations of a gift with sweets, which will suit one or another person. 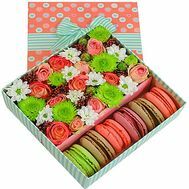 Our experienced florists made a huge number of flower-sweet combinations, thanks to which they can be given for a variety of reasons. 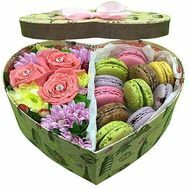 For example, sweets and flowers in a heart-shaped box will taste like a beloved woman on February 14. 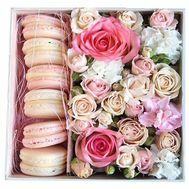 The sweetness and unusualness of the gift will make her the happiest on this warm and family holiday. 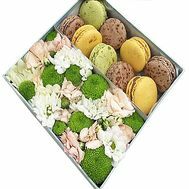 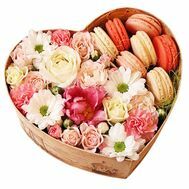 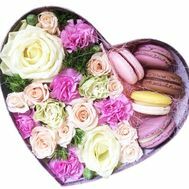 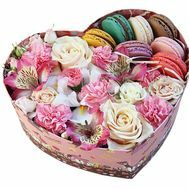 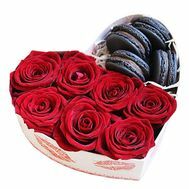 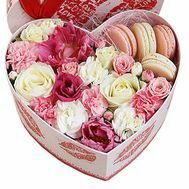 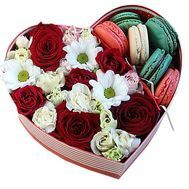 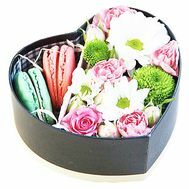 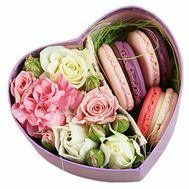 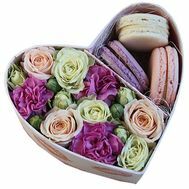 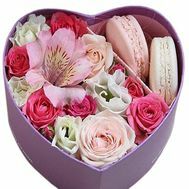 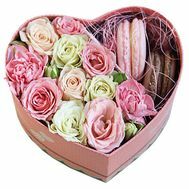 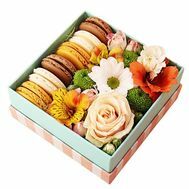 A hat box with large flowers and macaroons is suitable for congratulating with her help your favorite boss for a jubilee or a professional holiday. 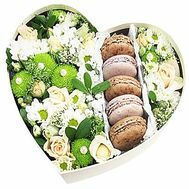 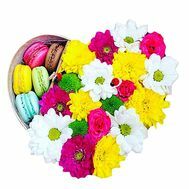 The delicacy of this gift and the qualitative selection of not only flowers, but also sweets of fresh freshness, will make of you the most attentive and responsible employee. 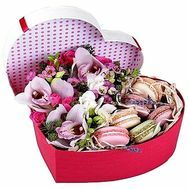 In the case if you want to surprise your family, mom and dad pleasantly, buy flowers in a box with sweets and a bottle of semisweet champagne - a present that any holiday will make special. 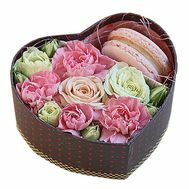 Another advantage of this gift is that you can order bouquets in boxes with a sweet addition at any time of the year. 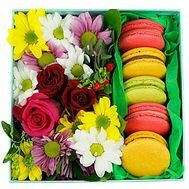 After all, the flower filling changes in accordance with the season and your requests, and sweets are available for purchase at all times. 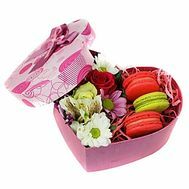 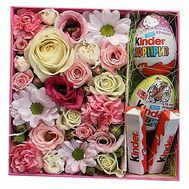 Where is simpler and more reliable to buy flowers in a box of sweets? 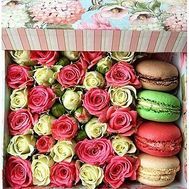 More than 10 years of experience, many payment methods, courier delivery of the world level - all this defines us as one of the most proven and reliable floristic salons in Ukraine! 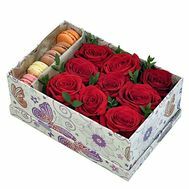 Our delivery service is open around the clock, and therefore you can place an order for any time - the courier will bring the gift at the appointed time. 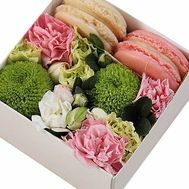 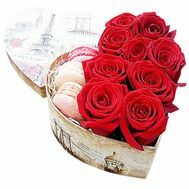 The delivery of flowers in a box of sweets takes only a couple of hours on any of the days. 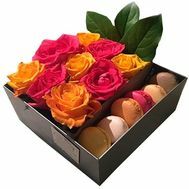 Also, when ordering a flower box, you can be provided with advice and professional help from our managers. 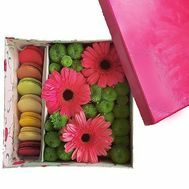 We pay attention to detail and each order separately, making it with a soul and great care for customers. 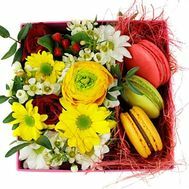 Thanks to us and our services, every Ukrainian can order a dream gift for his family and friends. 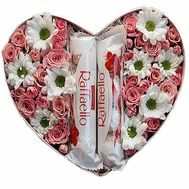 And in case you want to present a surprise - we can add a free postcard with wishes, drawn up by you for a special case!